(Newser) – Alcides Escobar started the World Series with a jolt. Five hours later, he ended the longest opener ever with a jump—into the arms of his joyous Kansas City Royals teammates. Saved by Alex Gordon's tying home run in the ninth inning off Mets closer Jeurys Familia, the Royals won in the 14th when Eric Hosmer's sacrifice fly scored Escobar for a 5-4 win over New York early Wednesday morning in Kansas City. 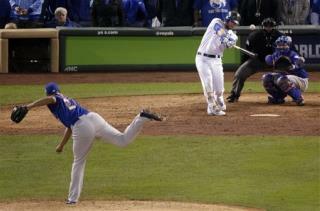 This tied for the longest World Series game in history, and it had a little bit of everything. A lot of everything, actually. Escobar hit an inside-the-park homer on the very first pitch from Matt Harvey. Later, a power failure caused the national TV audience and the team's replay rooms to go dark. Every time It seems the Royals can't come from behind and win another game, they come from behind and win another game. This team is amazing. GO ROYALS !!! Noam Chomsky: When I'm driving, I sometimes turn on the radio and I find very often that what I'm listening to is a discussion of sports. These are telephone conversations. People call in and have long and intricate discussions, and it's plain that quite a high degree of thought and analysis is going into that. People know a tremendous amount. They know all sorts of complicated details and enter into far-reaching discussion about whether the coach made the right decision yesterday and so on. These are ordinary people, not professionals, who are applying their intelligence and analytic skills in these areas and accumulating quite a lot of knowledge and, for all I know, understanding. On the other hand, when I hear people talk about, say, international affairs or domestic problems, it's at a level of superficiality that's beyond belief. In part, this reaction may be due to my own areas of interest, but I think it's quite accurate, basically. And I think that this concentration on such topics as sports makes a certain degree of sense. The way the system is set up, there is virtually nothing people can do anyway, without a degree of organization that's far beyond anything that exists now, to influence the real world. They might as well live in a fantasy world, and that's in fact what they do. I'm sure they are using their common sense and intellectual skills, but in an area which has no meaning and probably thrives because it has no meaning, as a displacement from the serious problems which one cannot influence and affect because the power happens to lie elsewhere. http://www.alternet.org/noam-chomsky-why-americans-know-so-much-about-sports-so-little-about-world-affairs Bring on the hate. That will make it all better.